BEIJING — Restricting the Vatican's control over the appointment of bishops in China does not infringe on religious freedom, a Chinese official said Tuesday, amid historic negotiations between Beijing and the Holy See aimed at healing divisions. Chen Zongrong, an official overseeing religious affairs, said Beijing would not allow "foreign forces" to govern the country's faith groups. "The Chinese constitution clearly states that China's religious groups and religious affairs cannot be controlled by foreign forces, and (the foreign forces) should not interfere in Chinese religious affairs in any way,"
"I disagree with the view that preventing Rome from having full control over the selection of bishops hinders religious freedom," Chen said. Speaking at a State Council briefing, the former vice administrator for the recently dissolved State Administration for Religious Affairs emphasized a need for faiths in China to "adapt to socialist society" and "develop religions in the Chinese context." 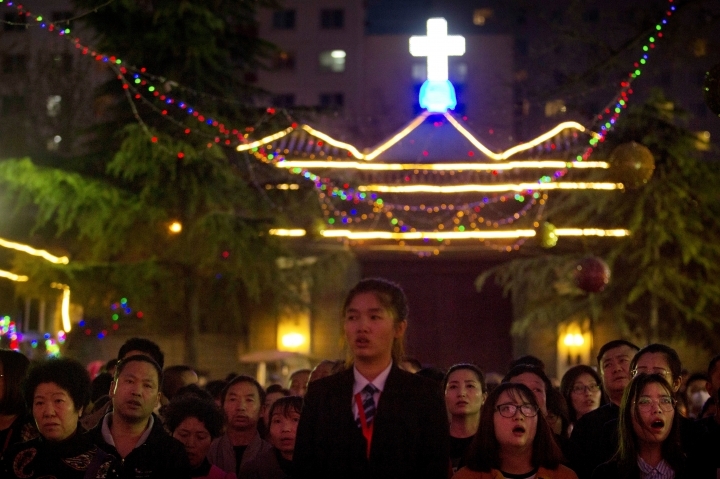 "Actively guiding religions in adapting to the socialist society means guiding religious believers to ... be subordinate to and serve the overall interests of the nation and the Chinese people," said a white paper released Tuesday. "It also means guiding religious groups to support the leadership of the Communist Party of China and the socialist system," the document said. The statements are in line with a push in recent years for major religions to "Sinicize" — code for accepting the ruling Communist Party's leadership over foreign influence. During last month's annual meeting of China's rubber-stamp legislature, the State Administration for Religious Affairs was folded into the United Front Work Department, which manages the party's relations with non-party entities, both domestically and abroad. "I believe there is no religion in human society that transcends nations," Chen said. 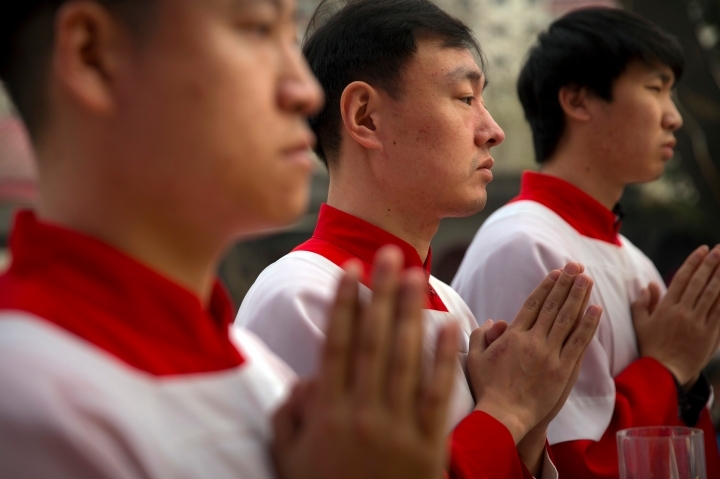 For years, China's Catholics have been split between those who follow state-authorized churches outside the Vatican's authority and those who attend underground churches that swear fealty to the pope. An expected deal between Beijing and the Holy See has spurred accusations that the Vatican is giving too much away after asserting the need for the Catholic Church in China to remain independent of government control over the nearly seven decades since relations were severed. Under the agreement being discussed, the Vatican is expected to recognize seven Beijing-appointed bishops not chosen by the pope, while two "underground" bishops would step aside. The Holy See is believed in the past to have objected to some of those unapproved bishops because of their personal conduct or other moral issues. 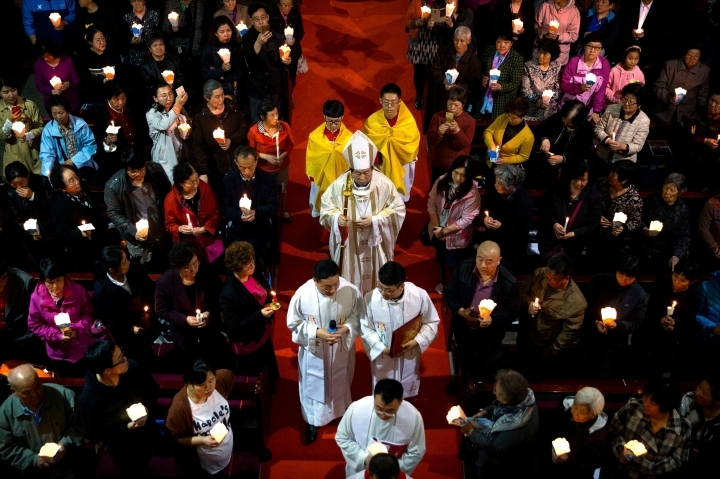 Guo Xijin, one of the Vatican-ordained bishops who may cede his post, was temporarily removed from his southern Chinese parish last week but returned in time for Easter Sunday services. Chen denied that Guo was deprived of freedom when government agents put him on a train to Xiamen, a city more than 255 kilometers (160 miles) from his Fujian province church, saying he'd been invited there by a local bishop. Priests and nuns in Guo's parish told The Associated Press last week that it was customary for authorities to require the bishop to take a forced "vacation" during sensitive periods. They said he had likely been taken this time to prevent him from speaking to the media about the ongoing talks with the Vatican, which have sparked a sharp backlash by some Catholic clergy and supporters of the underground church.